Wow, is about all i can say! We had a VERY cool hunt this morning! 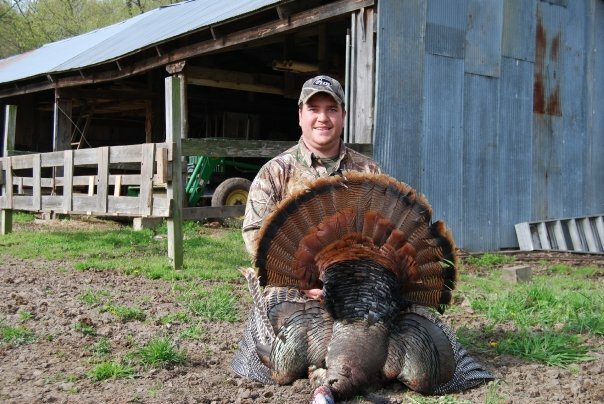 I cant think of a better way to end my sesason in MO than with a flopping tom!! Wow, is about all i can say! We had a VERY cool hunt this morning! A few days ago when Dan was in town we were running all over the place trying to get him a bird. In the process we stopped and talked to one of our landowners who said that the birds have been all over his farm. In fact, when Dan and i pulled in back by the barn and walked around the corner we could see them in his back field! Yesterday, I decided that i would stop by there in the late morning and see if there were any bird out. I was excited to see a big tom strutting with 4 hens in his back pasture. I then decided that i would come out later in the afternoon and get a blind built up for the morning. When Shawn and I showed up yesterday afternoon, there were two groups of birds STILL out there! A tom and four two hens, and another tom with a couple hens. We did our best not to spook them and got the blind set up for this morning. Shawn had to work this morning so Jeff offered to run the camera for me. We headed out a little later than we would like to, but i figured we would be alright since the birds don’t roost super close to the area we were hunting. When we got there we were disapointed that the cattle had trampled through our blind. We quickly built it back up a little and got settled in. The birds were gobbling like crazy in the roost a few hundred yards away. Finally, after what seemed like an eternity, the birds flew down. After they were on the ground, we didnt hear a single peep out of them. Jeff and i just sat there wonder which way the might have gone. About that time he told me to make sure the POV (point of view) camera was set up correctly and ready to go. We had he set up behind me, over my shoulder at the decoys so it would catch me draw, as well as get the second camera angle for the shot. I was looking at the screen making sure the camera was pointed correctly when i saw something walk into the screen! It took me a second to realize what was happening. I was watching the big gobbler strut into the decoys through the camera. 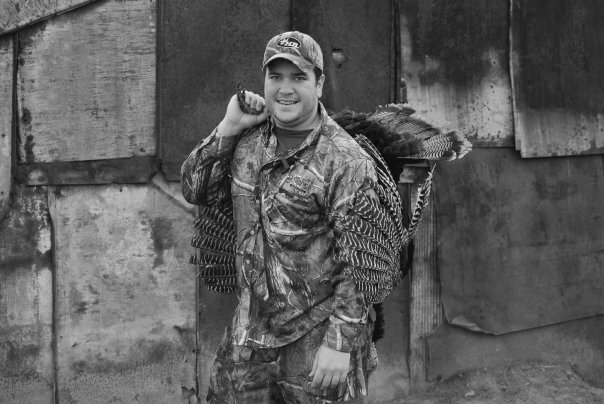 I slowly lifted my head and glanced toward the decoys to see a big strutter 30 yards and closing. He came right into the decoy and i quickly drew. This morning we forgot the stake for the decoy so we had him on a stick and i didnt want the tom to hit the decoy, knock it off the stick and spook. When i drew, he caught a little movement and came out of strut and slowly walked away. I put my 20 pin high on his back and released. The arrow sail with the green lumenock and thump him in the opposite wing joint and he went straight down and started flopping! It was a very thrilling, yet very quick hunt! 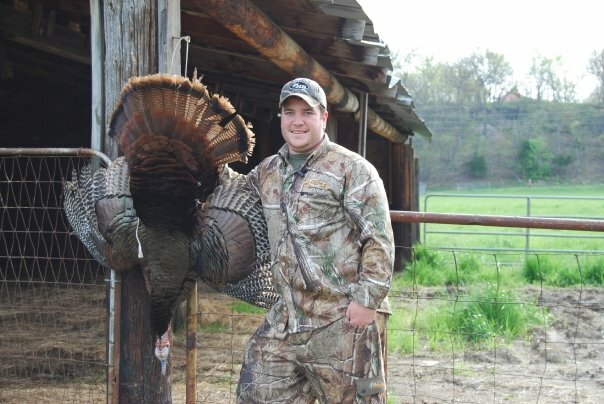 Those birds sure snuck up on us, but i cant think of a better way to end my sesason in MO than with a flopping tom!! Thanks for running the camera this morning Jeff! Congrats Mike,way to lay em down. Good scouting put to use. Great job.